Cats already think they’re superior to every other species on the planet, but now researchers at the National Institute of Standards and Technology are giving them even more reason to feel better than us: the elusive “quantum cat” has been created in one of their labs using photons. The quantum cat, or cat state, refers to the famed Schrödinger’s cat thought experiment, in which a cat in a box is simultaneously dead and alive. In the lab, a quantum cat would be a state where particles exist in two opposite phases at exactly the same time. NIST produced optical Schrödinger’s cats with pulses of light that possessed two opposite states, sort of like if two opposite phases had been superimposed. Above, the image on the left is the optical quantum cat created as NIST. The image on the right is a theoretical prediction of what such a cat state would look like. The images are strikingly similar. The quantum cat was created with ultrafast laser pulses that excited crystals to create a specific form of light containing only even numbers of photons. 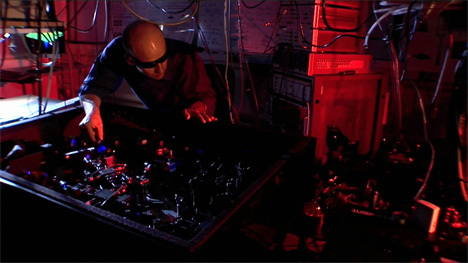 Then a specific number of photons were removed using a beam splitter and the remaining photons counted with a special NIST detector. The light that remains is in as close a state to quantum cat-ness as anyone has ever been able to get. 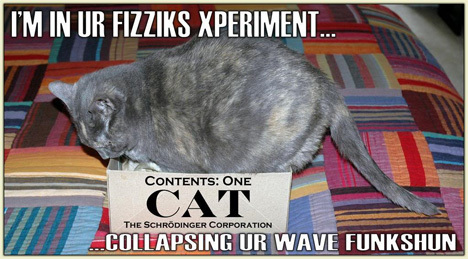 It’s not technically a “real” quantum cat, but it’s a darn good approximation. This isn’t the first optical quantum cat ever created, but it is the first to be made by detecting three photons at once. Making larger and more well-defined quantum cats will help researchers finally bring quantum computing and quantum communications into the realm of reality. As if cats needed one more thing to be all stuck up about. See more in Quantum Leaps or under Science. September, 2010.